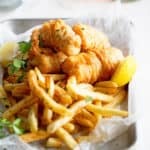 Fish and Chips Recipe (How to Make Fish and Chips) - The BEST fish and chips recipe this side of the Atlantic Ocean! Heat oil in a medium sized pot over medium high heat. Whisk together flour, eggs, baking powder, and salt in one medium sized bowl until smooth. Next slowly add in beer or milk and continue whisking until batter is combined. Salt and pepper fish then dip each piece into batter coating evenly. Fry fish in oil until golden brown and crispy. Next fry potatoes until golden brown.